If last weekend's Live Earth taught us anything, it's that we all need to take responsibility for our combined impact on the environment. Thankfully, monitoring our everyday impact may soon become much more straightforward thanks to the Carbon Hero, a portable carbon-footprint calculator. 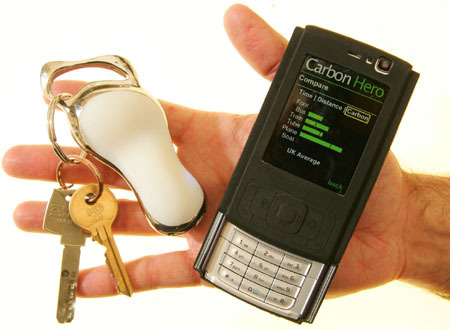 Although the dinky device, developed by a student at London's Royal College of Art, is still a prototype, it recently won an award at the BSI Sustainability Design Awards 2007 for its potential to make us all feel slightly guiltier in everyday life by calculating individual carbon expenditure levels. It works by calculating the exact carbon footprint of a user's travel habits by identifying different forms of transport and then monitoring location, velocity and pattern of activity to produce a single carbon impact readout. The calculations sound pretty complicated, but the theory's simple enough. Carbon footprint data can then be downloaded onto a PC and used to develop graphs identifying the harm you're doing to Mother Earth. No plans for the further development of the gadget have been released, but be sure to keep an eye on other people's key chains if you like driving your 4x4 to the chippy around the corner.